RED ALERT ON WOMACK CREEK, IF YOU’RE AN ALDER SHRUB! Pretty. Beetles can be beautiful. Ask a few alder shrubs on Womack Creek which are losing their leaves to adult and larval alder beetles. 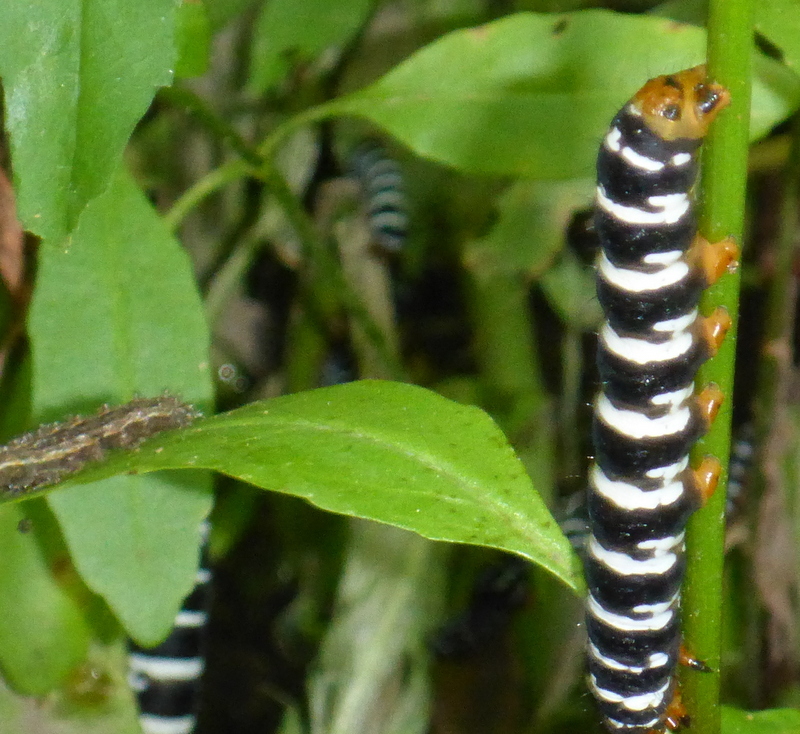 These grub with impunity, so it was not difficult to get photos of the adult, larva and pupa of the insects. Had it not been for a recent curator added to the inaturalist.org experts, I might never had this identified. There is very little written about this species, although it apparently is a North American native. If it contuinues its march along creeks and streams, eating alder leaves, it will soon be noticed. 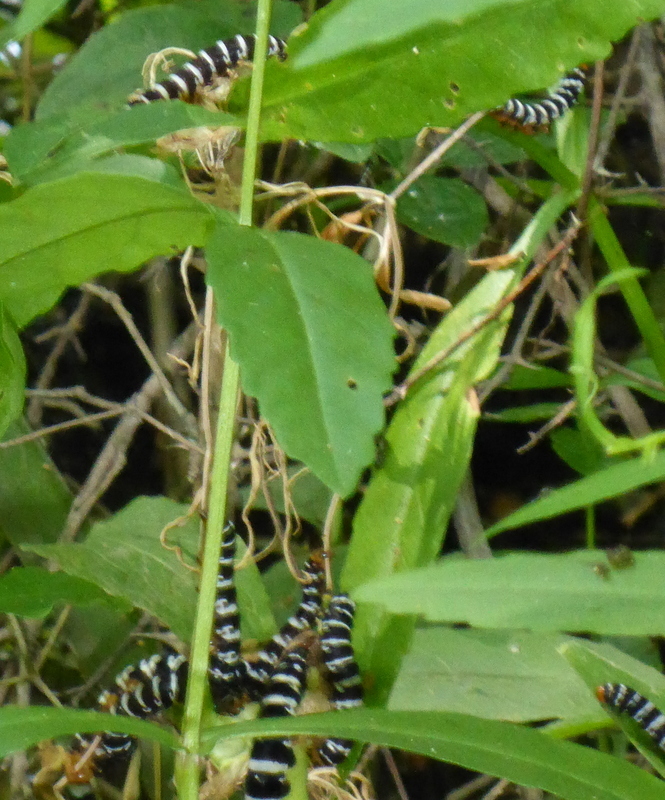 This entry was posted in Florida insects, Tate's Hell State Forest, Womack Creek and tagged Florida insects, Tate's Hell State Forest, Womack Creek on March 27, 2019 by marylynanded. When paddling…watch out for wasps! The hornets build high above in the trees; the wasps are within paddle stroke. This particular nest doubled in size in the last week! This entry was posted in Florida insects, Insects, Tate's Hell State Forest, Womack Creek and tagged Florida insects, Tate's Hell State Forest, wasps, Womack Creek on May 12, 2018 by marylynanded. This is a great year for swamp dragon head. They are now blooming everywhere there is sunshine: on dead tree falls with soil, in the back swamps beyond the trees, in sunny patches along the creek. In huge masses, they diminish the swamp roses. But those more demure blooms have a greater over reach — you can smell their cinnamon-sweet smell before you see them. Here, surrounded by narrow leaf primrose. Butterflies and bees are attracted to the nectar of the swamp dragon head. Soon, the arrow head blossoms will be in full bloom — they are heavily in bud throughout the creek. In other areas, with its strong sweet scent, the sweet bays are blooming. This entry was posted in Florida insects, Florida native wildflowers, Tate's Hell State Forest, Womack Creek and tagged Florida butterflies, Narrow leaf primrose, Swamp dragon head, Swamp rose, Sweet bay, Tate's Hell State Forest, Womack Creek on May 12, 2018 by marylynanded. Juveniles — teenagers — have a lot to learn. They are more curious than cautious, but in that, for humans, is hope — perhaps a new way to see things around us. 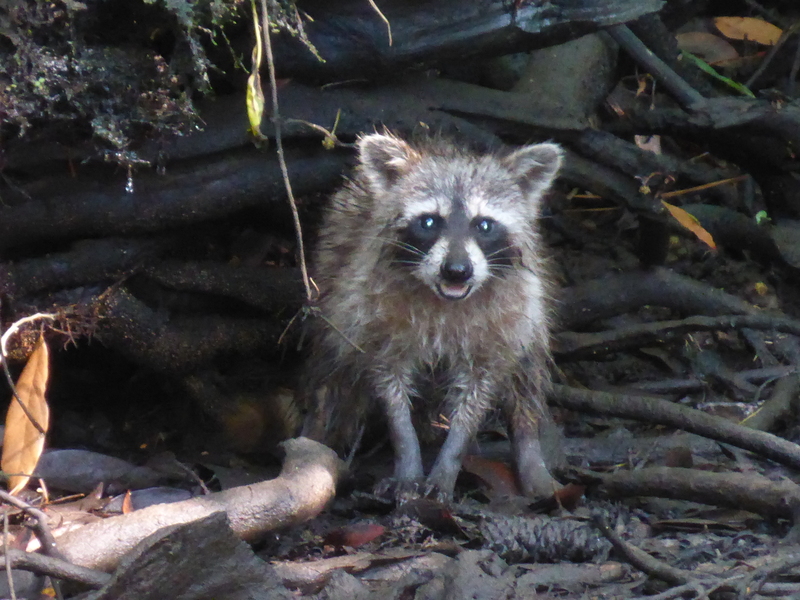 For critters, however, without an overarching adult watching, growing to adulthood is risky. 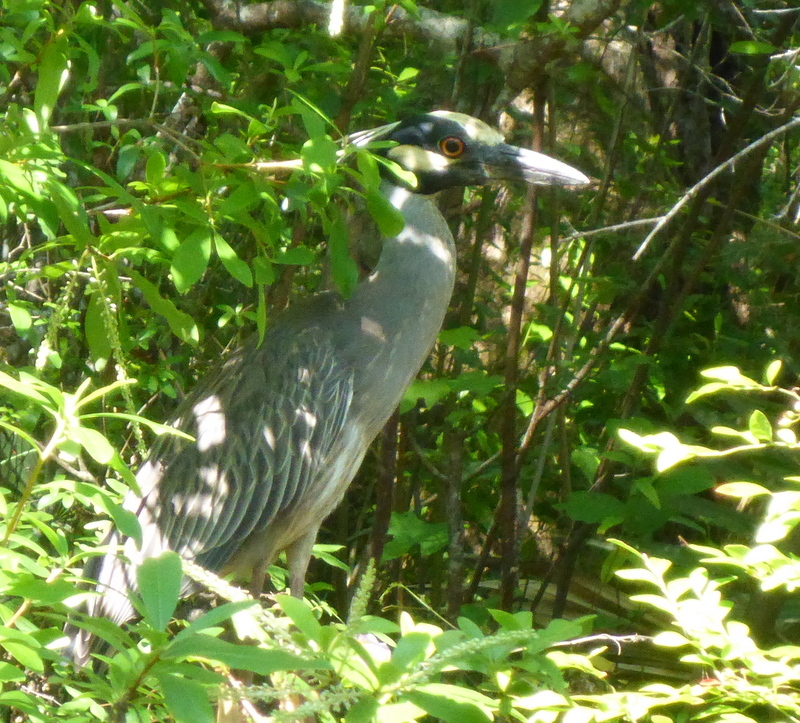 Alligator, raccoons, cooters and now, this yellow crowned night heron. Whatever it was doing when Ed came upon it, it diverted its attention to what was more interesting — us. As it went from muddy shoreline to a short step up a branch to a flight up to a higher branch, it’s eyes were upon us. But it did not fly away. It’s attention span was longer than our over 15 minutes. We paddled away as it continued to watch from its perch. 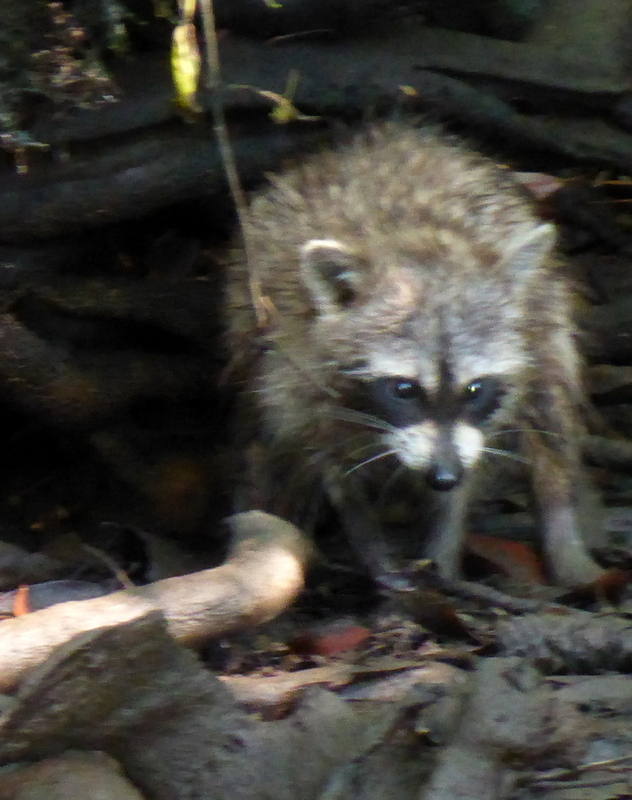 Meanwhile on the shore, a juvenile raccoon we had seen in January with its mother and siblings was foraging for a late breakfast, a little after 10am. Then, the mother had given her brood a sharp warning sound, which none of them heeded. She herself headed into the brush, they stayed foraging in the mud for crayfish and other goodies. Now, this one is on it’s own. 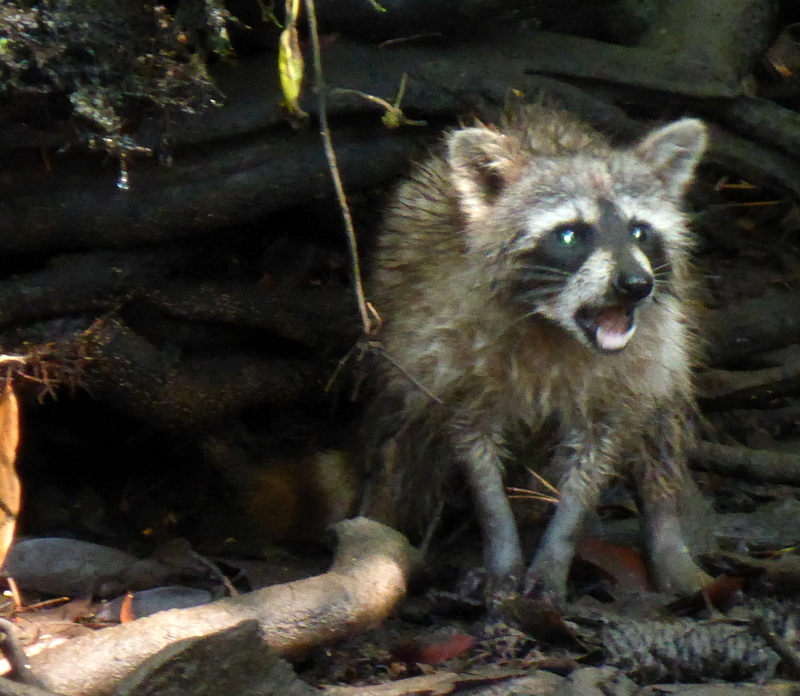 Again…our interest span was shorter that this raccoon. 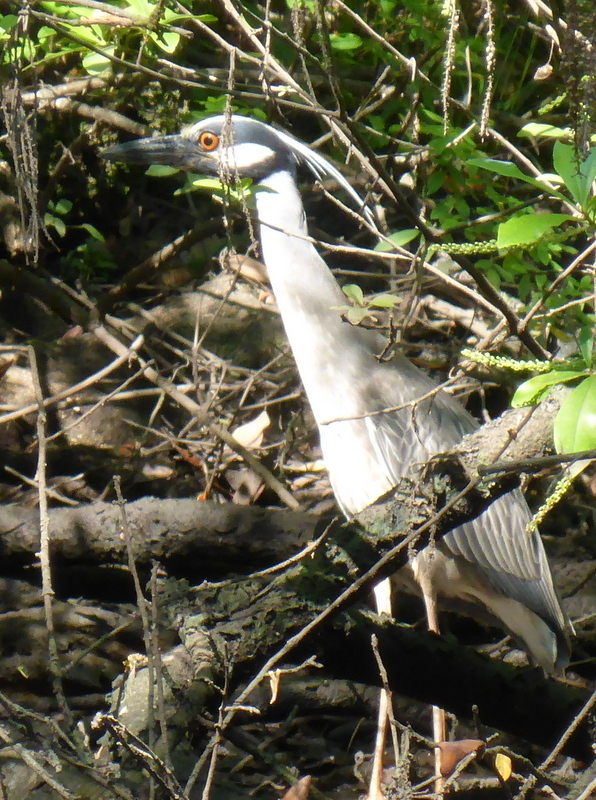 It continued to forage; we paddled upstream. 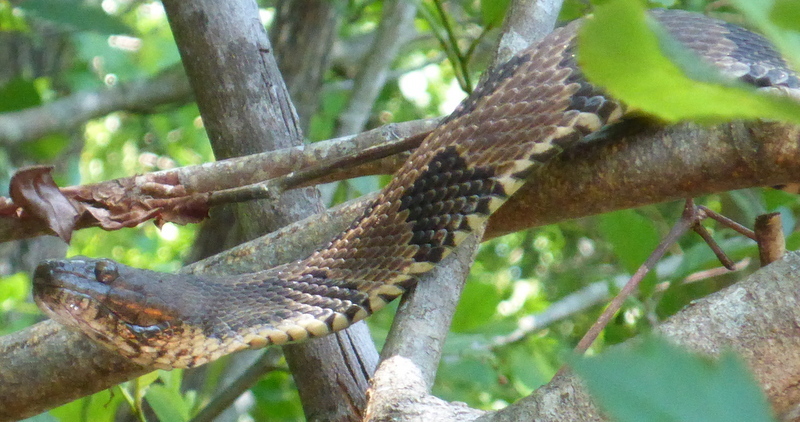 The non-venomous water snakes on the creek seem to be a lethargic group — they take their positions and stay there. Adults or juvenile, it doesn’t seem to matter. But this juvenile, after extending its forebody a bit, didn’t move. And then the caterpillars. Of what species I don’t know. They were too busy eating the leaves of both the cow creek spider lily and the swamp dragon’s head to take heed of anything. It’s a busy time on the creek and the young ones are doing what they need to be doing to continue their species. 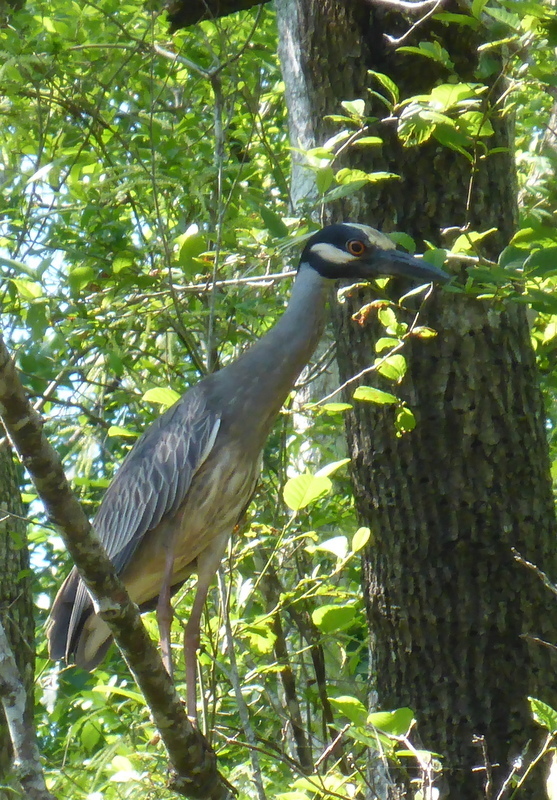 This entry was posted in Birds, Florida birds, Florida insects, Florida reptiles, Tate's Hell State Forest, Womack Creek and tagged caterpillars, raccoons, Tates Hell State Forest, water snakes, Womack Creek, yellow crowned night heron on May 12, 2018 by marylynanded.